Chateau Beaumont, one of the largest estates in the Medoc, dates its formation all the way back to 1772, when the property was originally created. However, vines were not planted at what we know of as Chateau Beaumont today, until 1824. In those formative years, the estate was only a fraction of the size it is today. Over the years, with new purchases and additional plantings, the vineyard continued expanding until it reached its current size. The chateau was designed and built in 1854. Jumping ahead about 100 years, in the early 1980’s much of the vineyards were replanted before the estate was sold in 1986, Groupe GMF, along with their partner, Suntory, who was already quite experienced in owning vineyards as they already the owner of Chateau Beychevelle, in neighboring St. Julien. 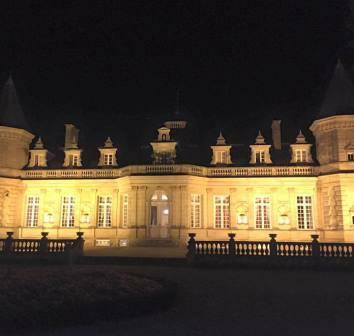 Currently, the property is owned by the same partnership group that owns and manages Chateau Beychevelle, the Castel group and Suntory, which also co own Grands Millesimes de France. The Left Bank vineyard of Chateau Beaumont is planted to 53% Cabernet Sauvignon, 40% Merlot, 4% Cabernet Franc and 3% Petit Verdot. The large vineyard is 114 hectares, making it one of the largest vineyards that is in one massive block of vines. The terroir is sand and gravel soils. The vineyard is planted to a vine density of 6,666 vines per hectare. The vineyard is farmed using Terra Vitis and Integrated Farming techniques since 2004. The vineyard is mechanically harvested. To produce the wine of Chateau Beaumont, vinification takes place in large, temperature controlled, stainless steel vats. Malolactic fermentation takes place in tank. The wine is aged in 30% new, French oak barrels for between 12-14 months before bottling. There is a second wine, Les Tours de Beaumont. The owner’s also make another wine from their vineyards in the Haut Medoc appellation, Chateau d’Avigny. On average, 50,000 cases of Chateau Beaumont are produced each year. Chateau Beaumont can be decanted for an average of 1 hour or so. This allows the wine to soften and open its perfume. Older vintages might need very little decanting, just enough to remove the sediment. Chateau Beaumont is usually better with at least 2-3 years of bottle age. Chateau Beaumont is best served at 15.5 degrees Celsius, 60 degrees Fahrenheit. The cool, almost cellar temperature gives the wine more freshness and lift. Chateau Beaumont is best served with all types of classic meat dishes, veal, pork, beef, lamb, duck, game, roast chicken, roasted, braised and grilled dishes. Chateau Beaumont is a perfect match with Asian dishes, hearty fish courses like tuna, mushrooms and pasta as well as cheese. Forward, approachable, easy to drink and correct, this medium-bodied wine gives you sweet red fruit from start to finish. Forward, early drinking, medium bodied, lighter style of wine. With its bright, fresh, red berry personality, this is best to drink in its youth. Forward, medium bodied, bright, red fruits with accents of tobacco, cedar , herbs, and red plums that will be easy to drink with just a year or two of age. Forward, generic, easy drinking, Left Bank wine with a fresh, red berry character for near term consumption. From a blend of 53% Cabernet Sauvignon, 46% Merlot and 1% Petit Verdot, the wine is medium bodied, bright and crisp, with an earthy, stern, cassis, cranberry, thyme and herbal profile. Correct, medium bodied, red berry dominated wine, with a bright, crisp, simple red fruit finish. Early drinking, medium bodied, correct, but unexciting wine made from a blend of 53% Cabernet Sauvignon, 46% Merlot and 1% Petit Verdot. Equally simple and charming, this medium bodied, earthy, easy to like, cherry tobacco and earthy wine is fully ready to drink. Easy drinking and round textured, the wine is filled with ripe, sweet, juicy plums and black cherries, with an earthy, forest and tobacco note to make it even better. There is no reason to hold this any longer.